Reads Court Holiday Apartments and Suites have been providing self-catering holiday accommodation for over 25 years for families and couples. 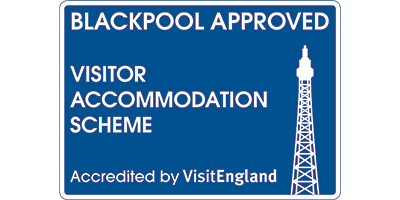 We are ideally situated for many of Blackpool's top attractions. With capacity to cater for 2 to 6 people, each Apartment is unique and we like to think is a home away from home. Each individual apartment is fully heated and furnished to a high standard. All offer a well equipped kitchen, shower room, digital television and complimentary WiFi. Large cosy beds, crisp linens and fresh towels are all provided. Cots and highchairs are available upon request. The iconic Blackpool Tower is clearly visible from some of our apartments. Reads Court is minutes away from the town centre, with its bustling shops and main shopping arcade, the famous Winter Gardens and Golden Mile. Blackpool has many pubs, clubs, restaurants and places of entertainment. And of course the ever poplular Blackpool Illuminations. We take the greatest care and endeavour provide a friendly service that is flexible and accommodating to your needs so you can have an enjoyable and relaxing stay. We have a range of apartments tailored to suit a variety of needs. To access Reads Court there is a small step at the front door then Reads Court boasts 4 ground floor apartments with the remaining 6 apartments are spread over the 1st and 2nd floors, there is no lift. For more information on our apartments click here and to book online use the search button below for our best available rates.